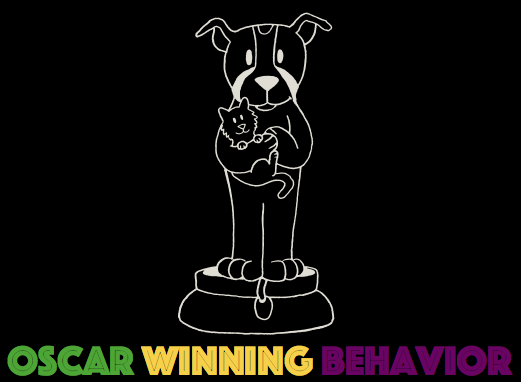 The goal for crate training is to provide a management option for you in which your dog feels safe and happy, and you are able to keep him out of trouble, and away from danger. No matter how old your dog is, from puppy through adulthood, you’ll go at whatever speed your dog dictates so that the crate is always a happy and comfortable place for him. First, selection: You can’t really go too big, but you’ll need to get a crate that is large enough for him to stand and turn around in easily. After size, you’ll want to think about material. There’s a huge variety of options out there – plastic “airline” kennels, metal folding crates, heavy duty steel and even fashionable wicker or wood. You can get any you like, but you may consider where you’re going to put the crate, and if you know your dog is a chewer. You’ll put the crate somewhere where the dog can still feel part of the action, but not in the middle of the busiest traffic intersections. This may mean your bedroom, or the tv room, but probably not your basement or guest room, unless you happen to spend time there. Your dog wants to be part of your family, the crate shouldn’t mean solitary confinement. What goes in the crate depends on your needs as well as your dogs’. You’ll almost certainly want some sort of padding in the bottom, rather than bare floor. If your dog is a chewer or has a history of swallowing things, look for a chew proof mat, but otherwise the sky is the limit. You can toss an old bath towel down, buy a lush memory foam bed, or anywhere in between. You might consider getting two, so they can be rotated out for easier washing. Toys may be nice additions, too. I generally feed my dogs in their crates – with multiple animals this means everyone can eat uninterrupted, but it also means their crates are pretty great places to be, since every time they go they get dinner! I deliver meals in work-to-eat toys or slow feeder bowls so the meals don’t get scarfed up in seconds and the dogs’ brains are working even when they’re crated. I also provide a sturdy chew toy, like an antler or heavy-duty nylabone. If you’ve done a good job making the crate a happy, comfortable place, you may find your pup using it as his own “bedroom” and bringing his favorite toys with him when he goes in (like my little hoarder here). That’s absolutely fine, provided the toys are safe and he won’t swallow anything (causing potential choking or blockage hazards). You’ll need to test things out first to determine if he’s likely to break teeth on a hard toy, or tear and swallow something soft- all dogs are individuals, so your mileage may vary with every object you provide! So now that we have the set up so cozy we almost want to nap in their ourselves, how do we get our best buds comfortable in there? Each step below could take days, it could take weeks – it’s all up to your dog. It’ll depend on how comfortable you make the crate, and more so on any past experiences with the crate. It doesn’t mean you’ve failed him, or that he isn’t a smart wonderful perfect puppy, if you aren’t able to get this done as fast as you’d like. It just means he needs more time. Take a deep breath and give it to him. We’ll start just by opening the door, and without gesturing, suggesting, or otherwise attempting Jedi mind tricks, leave the crate for the dog to explore when he’s ready. Some dogs may walk right in – if he does that, give him a treat while he’s still in there! If not, don’t worry. Just play it cool, and when he’s not looking, toss a few bits of dry biscuit or his kibble inside for him to discover on his own. (Use extra caution if you have other animals in the house who might quarrel over the found treats.) 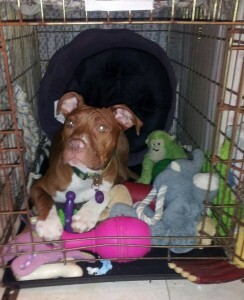 If there’s a favorite toy, you might toss it in the crate while you’re straightening up the rest of the room. Do this several times a day, with no warning, just throw a few surprises inside. When you start to see your buddy checking out the crate even when there aren’t goodies in it, you can move on to the next step. For this next step, you’ll toss some dry treats inside while he can see you. Once he’s in the crate, hand him (or toss in) some bits of real hot dog, chicken, cheese – something really high value that he’ll love. The message here is that going in the crate is pretty good, staying in the crate – even for a few seconds – is great. If he stays in for a second after the food stops, give him a bit more. If he comes out again, don’t worry. Repeat the game (dry treats to get him in, fancy stuff to keep him there) two or three times and then end the session. You can play that several times a day. When he’s staying in for five or ten seconds without a steady stream of food, you can move on to the next step. Now you’ll toss dry treats into the crate, and when he goes in, close the door, feed him the higher value chicken or cheese, then immediately open the door again. If he stays, close the door again, feed more goodies through the bars, and open up again. If he comes back out, no problem, just start over with the dry treat. Repeat this three or four times before taking a break, and do this exercise a few times throughout the day. When he’s staying inside between all three feedings, move on to the next step. At this point you can also start feeding him meals in the crate, if you like. Simply place his bowl (or food toys) inside and leave the door open. If he stays outside the crate, that’s fine, but next time put the food a little further back. If you notice him hesitating to go in for a meal, repeat this step for a few more days rather than moving on. By now when you go towards the crate, he’ll likely start showing interest in it, too. If you still need to toss dry treats in, do so, but if he goes in without them, take advantage of it. Close the door calmly, and leave the room. Immediately come back in, feed him a treat through the bars and leave again. Repeat three more times, then let him out. Your absence from the room should be just a few seconds each time. Practice this several times a day. When he can go into the crate when you open the door without you tossing treats in, repeat for one more day (three or four more times), then move on to the next step. This next step should be done before mealtimes. You may find it helpful to break up the daily meals into several smaller portions so you can get more rehearsals in each day. What you’ll do is put him in the crate (by opening the door – he’s going in on his own now, right? ), close the door, then go into the kitchen (or other room) and prepare his meal. Putter around the house for a few seconds (five or ten, not 30 or 40) and then bring his food over, open the door and give him his meal before he steps out of the crate. Leave the door open and walk away. If he steps out to eat, that’s fine! When he stays inside and finishes his meal before coming out, you can move to the next step, which is telling him to go in on cue! “Box!” (cheerfully! This is a fun place for him to be!) MOVE. Once he’s inside, give him that high value treat and let him back out. If you wait a breath before moving, after saying the word, you’ll be able to see when he makes the connection. “Box!” BREATHE then MOVE. When he’s going in on cue, continue the previous step. Put him in the crate randomly throughout your week, as often as needed, and always have it predict yummy treats, a meal, or other goodies. Always remember this is his private alone space, and should never be used for punishment, nor should anyone (especially children or other pets) be allowed to force themselves inside, or take any of his goodies. Remember that puppies shouldn’t be expected to “hold it” longer than one hour for each month of age up to about 8 months, and even adult dogs would do better with breaks rather than marathon sessions closed up. Keep faithful to these ideas, give him all the time he needs, and before long you’ll be asking how to get him out!